Screening for sudden cardiac death (SCD) remains one of the more contentious debates in the world of sports medicine. As a matter of public policy, consensus medical opinion in the United States still argues against universal, mandatory screening with electrocardiograms (ECGs); whereas in Europe, specifically in Italy, ECG screening is more of a routine practice. The debate over this screening is carried on at many conferences and in many medical journals, including ours. We’ve previously looked at the question of whether it makes sense to screen North American athletes with ECGs, for instance. Earlier this year, we published a review of the different approaches American universities are currently using regarding the issue of athletic cardiovascular screening. Recently, the topic came up in the podcast discussion I had with Dr. William Roberts on new directions for the pre-participation evaluation (PPE). American and European sport medicine bodies can find a lot of common ground in where the PPE can be improved, according to Dr. Roberts, with the principal exception of this one issue. Our Division of Sports Medicine has been hosting another international guest this past month: Dr. Jose Angel Garza, a sports medicine physician from the University Hospital of the Universidad Autonoma de Nuevo Leon (UANL) in Monterrey, Mexico. He was also present at Dr. Viskin’s talk, and I asked him for his reflections on the subject of mandatory ECG screening in athletes. 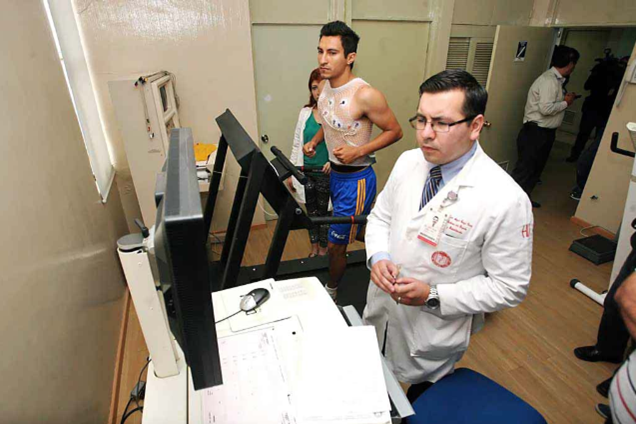 Among the sports medical community, there is an ongoing and often heated debate on whether mandatory ECG screening should be performed on athletes. Several countries such as Italy and Israel have implemented such measures. The European Society of Cardiology has issued recommendations about mandatory screening of athletes with ECG. So this begs the question: Does ECG screening save lives in athletes? In the United States, the current landscape of pre-participatory screening required in most youth sports involves mainly personal and family history taking and physical examination, reserving cardiovascular screening only for those patients with symptoms suspected to be of cardiovascular origin. The current American Heart Association (AHA) statement critiques the available evidence that suggests ECG as a screening method to detect cardiovascular disease in young people. Furthermore, many would argue that the low incidence of sudden cardiac death does not justify the cost of screening millions of young athletes. This past week I had the opportunity to attend a conference given by Dr. Sami Viskin, director of the Cardiac Hospitalization Unit at Tel Aviv Medical Center, who shared the Israeli experience of ECG screening. In 1997, Israel enacted the The Israel Sport Regulations on Athletes Medical Testing. This law requires all athletes to undergo medical screening by accredited physicians. The screening consists of a medical questionnaire, physical examination, resting ECG, and Bruce protocol exercise testing. Dr. Viskin and his group adamantly believed that these measures were not justified, considering the limited evidence mainly based on one Italian study that suggests that this strategy prevents sudden death in athletes. The Italian study compared the incidence of sudden death in the two years prior to enacting their law of ECG screening of athletes in 1982, to the 22 years after which demonstrated a decrease in sudden cardiac death. Dr. Viskin argues that this study compares their results to a brief two-year window in which there may have been an increase in cardiac deaths. In Israel, there was a peak of sudden cardiac deaths in the two years prior to enacting the law of 1997. Dr. Viskin argues that the public outcry and increased media attention may have led to the legislation mandating ECG screenings. He performed a similar analysis to the Italian study, only that he compared the incidence of sudden cardiac death in the 12 years before the law to the 12 years that followed, and his results showed no significant reduction in the incidence of sudden cardiac death. Had he only compared the two years prior to the enactment of the Israeli law to the 12 years that followed, then the results would have shown that these measures were effective for preventing sudden death among athletes. Dr. Viskin went on to describe other important issues with having a mandatory ECG screening program. A positive or inconclusive ECG test would legally bind you to perform follow-up tests that not only prove to be very expensive, but have shown to be mostly negative for most athletes. Then we have the issue of having to sideline apparently “healthy” or asymptomatic athletes while we perform follow-up testing. Disqualifying athletes based on an ECG screening would certainly be a difficult task for all involved. So the question persists: Does ECG screening really save lives? This is definitely an issue that will continue to foster debate in the years to come. 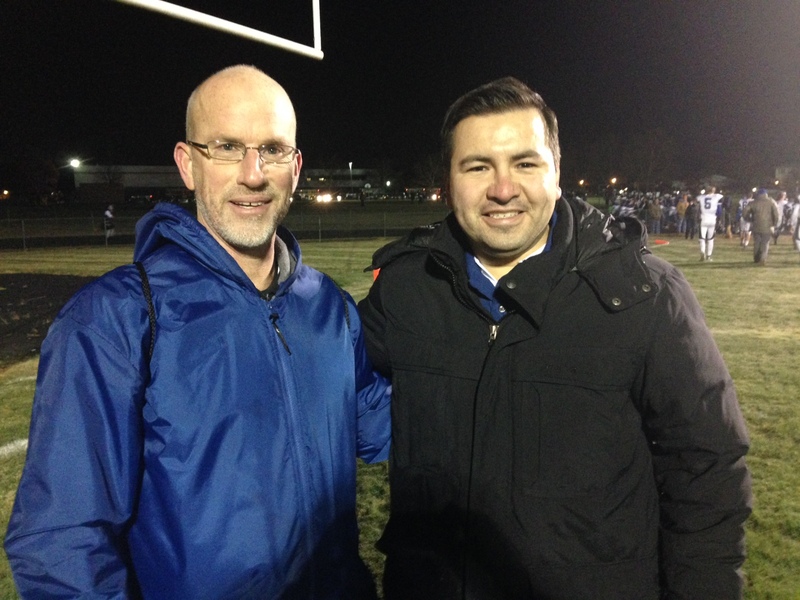 With Dr. Jose Garza, at a recent high school football game: coverage never gets this cold in Monterrey, does it Joe? Dr. Garza, thanks so much for your contribution. And Dr. Viskin, thank you for your visit. It is a great pleasure and privilege to get exposure to international perspectives on sports medicine; it has been enlightening to get both the Israeli and Mexican perspectives on this and many other important issues in the world of sports medicine.